0 Comment July 18, 2018 Like? Here’s is how we setup our portable live streaming equipment on site when we leave our studio. In this video, the PTZOptics team shares insights on their portable/mobile live streaming system setup from a recent on-site music festival video production gig. This year the PTZOptics team used the PTZOptics Producer Kit to live stream a multi-camera production using SDI and Ethernet connections to multiple cameras. The SDI connections generally used for uncompressed 1080p30fps video and the ethernet connections are used to power each camera and provide camera control. As you can see, we used (3) PTZOptics 12X-SDI cameras, one upgraded with the NewTek NDI, along with vMix and the PTZOptics Producer plus Kit. This system is portable and you will see that we used a foam protective case for transporting our PTZ cameras around. This is a Members Mark travel case where we have cut out the foam inside to perfectly fit two PTZOptics cameras. 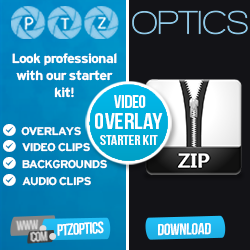 The PTZOptics Producer Kit can be used for mobile applications and setups onsite but we usually recommend purchasing a protective case like the Members Mark. These protective cases can be used to store your live streaming computer, monitors, cables and much more. As you can see from the video, there are a lot of considerations besides technology equipment that you should think about when you are setting up a portable live streaming system. It can take quite a long time setting up your live streaming area with tables, sun tents, power supplies and an internet connection before you can start testing your equipment. I would budget 1-2 hours for setup before you even start setting up your live streaming equipment. There are some time-saving tips I can share you with and of course, much or this setup may already be taken care of ahead of time. Work with your audio guy! If you are live streaming during the day this may be unnecessary. But if you plan to live stream into the night consider low light camera settings and bringing additional lighting for the night. An IP network will also help you control all of your cameras. This is handy for tweaking camera settings on the fly. Some of the tips I would add to our blog posts here include being prepared and understanding the technology you are working with. The biggest improvement we have made over the years has to do with IP networking. We always set up all of our cameras with unique IP addresses which allow our video production software (vMix in this case) to communicate with our cameras. This IP communication allows us to operate Pan, Tilt, and Zoom plus setup PTZ camera presets. These PTZ camera presets can be used to operate the cameras automatically on a playlist or simply quickly recall the camera placement we need at any given time. For example, each band that we live streamed during the 2018 Pretty Good Fest was a little bit different when they set up on stage. So, we would quickly update our camera presets for the different locations of a band member. Another tip for managing multiple camera angles and video inputs with your mobile live streaming setup is using a multiviewer. A multiviewer allows you to quickly glance at a variety of video inputs that you have available in your video switcher on a single screen. This screen usually shows your live stream output and the preview window along with a nice layout of your other video inputs. I suggest bringing a secondary monitor to use for this purpose and potentially for logging into your social media networks and/or monitoring the chat rooms and live stream. Protect your live streaming equipment and invest in quality protective cases and storage bins. We use plastic storage bins to transport all the cables and connectors we use on a regular basis with our live streaming setups. Also, make sure that you scope out your location and ask for help if it’s available. For example, you can ask for the location to provide an ethernet cable to your event space. You can also have the facilities team potentially run power and have tables awaiting your arrival. You can also research the network available for you at the event space and ask about the IP network in place. Do they have a specific IP range that they are using? Can you use set the IP addresses of your cameras ahead of time? It’s possible that you can request static IP addresses for your PTZOptics cameras and have them ready to go as soon as they plugin. This is an important tip because sometimes your cameras IP addresses can be on a different IP range from the IP address your computer has received through DHCP. So consider asking these questions ahead of time and you can be more prepared on arrival when you show up at your on-site location with your portable live streaming equipment. Finally, if all of this live streaming technology and equipment is new to you… Go out and shoot a test stream. Heck, offer to do a live stream for free and learn from the experience. We have produced countless live streams as we learned how all of this technology works! And of course, most importantly, have fun! Learn how to optimize your camera settings for live streaming in low light here. Learn how to color match and grade multiple cameras here. 2nd annual brief history of live streaming panel w/ Top industry experts here. Q&A on the history and future of live streaming w/ top industry experts here. NewTek NDI for beginners here. How to build an audience response system for live streaming here. An executive producer's job in the live streaming world here. Tips from 7 of the industries top live streaming professionals here. Here are some tips for setting up PTZ cameras in a portable live streaming setup.